Losing your baby teeth as a kid is a rite of passage. It’s a sign that you’re getting older and might be finding a quarter or two under your pillow after a visit from the tooth fairy. Unfortunately, losing a tooth as an adult is much less fun. It’s often a sign of a more serious dental health issue. 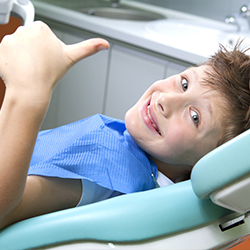 Whether it is lost due to decay or trauma, it’s important the missing tooth is replaced. Today, we’ll be discussing some of the effects when a missing tooth isn’t replaced. If you have lost a tooth recently, call Dr. Burchman today to schedule an appointment. Not replacing a missing tooth (or multiple teeth) is the leading cause of jaw bone loss. This is because teeth stimulate and support the jaw bone. When a tooth is missing, the bone it was connected to is no longer being stimulated. The result is similar to when an unused muscle atrophies. A dental implant will contain screws that fuse together with the bone, providing both strength and support. This process is called osseointegration. While teeth are solidly attached to the jaw bone, they can still shift positions over time. This can be caused by gum recession, tooth decay, and some other situations. When a tooth is missing, it can accelerate the shifting process, as adjacent teeth will attempt to move into the empty space. As one or two teeth shift, it will cause the rest of the teeth to follow, causing issues for the bite overall. 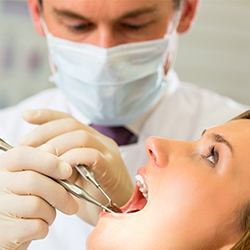 As teeth shift to fill the void left by a missing tooth, bite irregularities will develop, impacting the overall health of your remaining teeth and gums, along with your head, neck, jaw muscles and jaw joint. The resulting malocclusion affects how your teeth come together when you bite down. Malocclusion can result in more problems, including headaches, muscle pain, wearing of the teeth, tooth loss, abnormal sensitivity, and TMJ (temporomandibular joint) disorder. While orthodontic treatment can correct malocclusion, it is expensive and often takes a great deal of time. With empty spaces, shifting teeth, and irregular bites developing, it stands to reason that eating becomes more difficult when teeth are missing. When teeth are missing from the front, it makes it harder to bite off pieces of food. If teeth are missing from the back, it makes it tougher to grind up meat and other food into small enough pieces that we can swallow. This means missing teeth can also cause digestion problems like acid reflux. Unless you’re a hockey player, you probably don’t want to have your smile marred by empty spaces where teeth used to be. Not only does it affect your smile, it affects the entire shape and structure of your face. This is because as a jaw bone atrophies, your face begins to look older and more sunken in. Your teeth play a role in how you speak, surprising as it may seem. When teeth are missing, pronouncing words can be more difficult. This can result in slurring, whistling, and spitting when you try to speak. Replacing a missing tooth will ensure you don’t have trouble speaking. A missing tooth is incredibly important to replace in order to avoid the issues we’ve discussed today. If you have a missing tooth that you’ve been ignoring, call Dr. Mel A. Burchman in Langhorne to get it replaced.